Thursday November 24th 1898 Thanksgiving Day. I put in the most of the forenoon roasting a duck for our dinner. I churned again today and got the clothes in and ready to iron tomorrow. Friday November 25th 1898 I ironed in the forenoon and got dinner early for Will to go to town with the butter. It snowed in the forenoon. They finished husking the corn on the east side of the road. Rob Whetstones was home a few minutes says Edith is about the same. I swept in the afternoon and did some cooking. Will brought home papers so we read all the evening. Saturday November 26th 1898 I did a lot of mending today besides the regular work. The boys got some wood from out timber and did work around the barn. A very cold day. We heard Edith is better. Sunday November 27th 1898 I read and wrote what spare time I had and was busy a part of the time with the work. 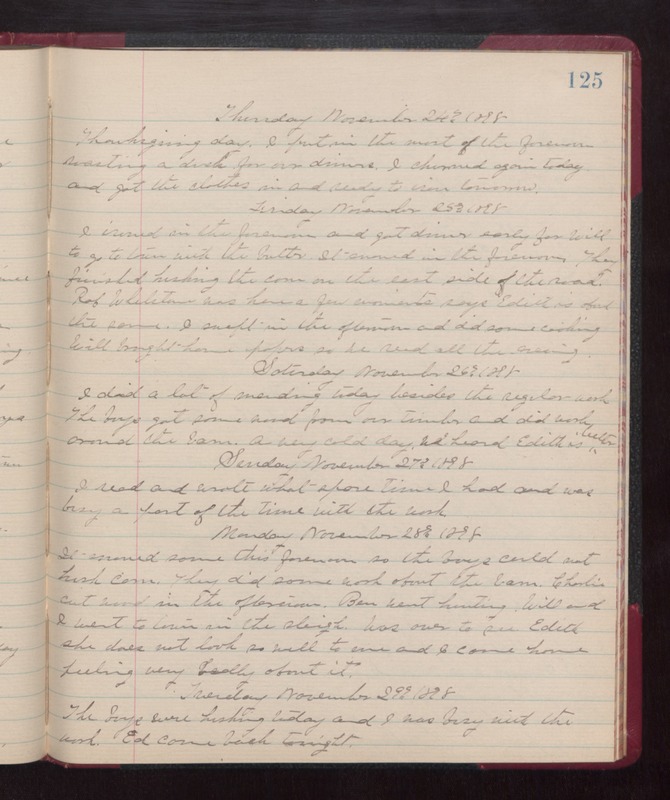 Monday November 28th 1898 It snowed some this forenoon so the boys could not husk corn. They did some work about the barn. Charlie cut wood in the afternoon. Ben went hunting. Will and I went to town in the sleigh. Was over to see Edith. She does not look so well to me and I came home feeling very badly about it. Tuesday November 29th 1898 The boys were husking today and I was busy with the work. Ed came back tonight.